Last time I rode on the grounds of Fairfield Hills it was the late 1990s for the Second Company Governor’s Horse Guard Judged Pleasure Ride. This annual event has obstacles to tackle, things to pull, gates to open and executing some pretty scary stuff that you’ve probably never done on your horse before that day. Aside from the mylar balloons that thwarted our team’s chances at glory that year (we came in second) its challenges are nothing compared to what I encountered this past Saturday trail riding during the Mad Dash Adventure Race, but more about that later. This past month, I’ve been blessed to return to ride the hills. A benevolent friend takes her horses and me out to enjoy this hidden beauty nestled in the center of town. I don’t know who or what organization mows those lovely paths around the perimeter of the fields, but thanks! It creates long ribbons of green velvet that cushions unshod hooves at the canter while riders can focus on the majesty around them. The tall grasses, crying to be turned into succulent bales, surround us so we look like floating upper bodies in a sea of timothy. Unlike higher elevations in town, the sky opens up at these hills with clouds dusting the treetops, when the wind is just right. A red barn, a brown barn, a ghostly metal pavilion dot the landscape as we bob along. We land at crumbling roads, now more gravel than tarmac, fallen prey to rainwater, erosion and neglect. We dive into open vistas, birds dart from the grassy depths as we gallop by, the good horses taking them in stride, not spooking at nature’s presence. Riding up the hills are especially joyous, faster and bolder, easier for them, more fun for us! Sweat builds on their shoulders and haunches, signs that the day is getting hotter, and trails traversed longer. Another field, now plowed dark, waiting for seeds, fills the air with earthen scents. As we trot along the far side, silent stream to our left, fallow fields to our right, we slowly come to a walk as we met the long black driveway taking us far from where the cavalry horses and military dogs live. Ahead lies one final burst of pleasure called Yahoo Hill. But first, we must cross Wasserman Way with rattling trucks and speeding cars, save but one, who slowed to a stop for the safe passage of the horses into the woods. A left turn, exploding up the hill, muscles rippling, hooves reaching, hocks pushing against the soft soil, trampling tall grasses down to the earth, slapping reeds echo as if cut in harvest. Atop the hill, nostrils flaring and heavy breathing from horse and rider, wide smiles all around. A great way to start the day in Newtown, still morning, not yet feeling the heat and hectic-ness of the day. Horses bow heads in agreement. 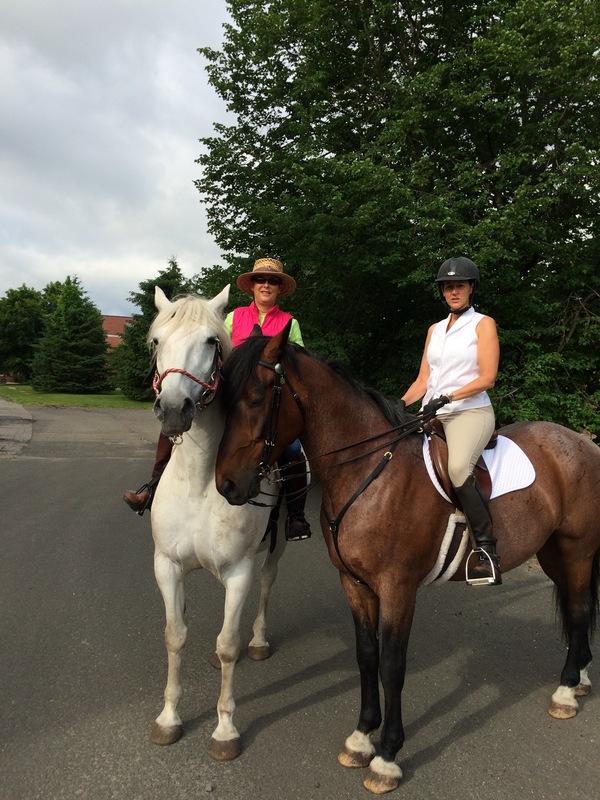 On Saturday, our trail ride grew to three gallant steeds and towards the end took us on a magical woodland journey. Blazing through fragrant pricker bush roses and other sweet-smelling native shrubs, disrupting bumble bees and scattering small birds, we came upon Deep Brook. Descending a rocky bank, a pause for an equine drink, up the muddy slope into soft pine needles soaking up splash and muffling footfalls. Among majestic pines we meander along the river, up a steep incline into the cool forest. We turned right, across the Housatonic Railroad line onto a hidden, ancient trail. We walked along a former railroad bed, still clutching its old steel rails and rotting wooden ties. We weaved between strong maples disrupting the order and symmetry of the forgotten spur. We emerged from behind the old storehouse at Fairfield Hills. We ended at the intersection of Wasserman’s Way and Traders Lane. Waiting for the traffic light to turn to green, the Mad Dash Adventure Race was in full swing. Who knew? As we worked our way back to our respective horse trailers, fire engines sprayed water, tents and flags fluttered, runners scurried through mud pits, over tall wooden walls, and across slippery grass. This got the horses’ attention! As we neared our trailer, a big wave of children came crashing down on us — part of the Mini Dash for kids — dozens of them came barreling at us full speed with glowing t-shirts of orange, lime green and pink. Just before impact, they thinned into single file, banking right and away from us. The horses, prick eared, looking, thinking, moving sideways, waiting, then exhaling, relaxing, and head lowering as we ambled back to the trailer. I remarked to my friend, “Talk about distractions! 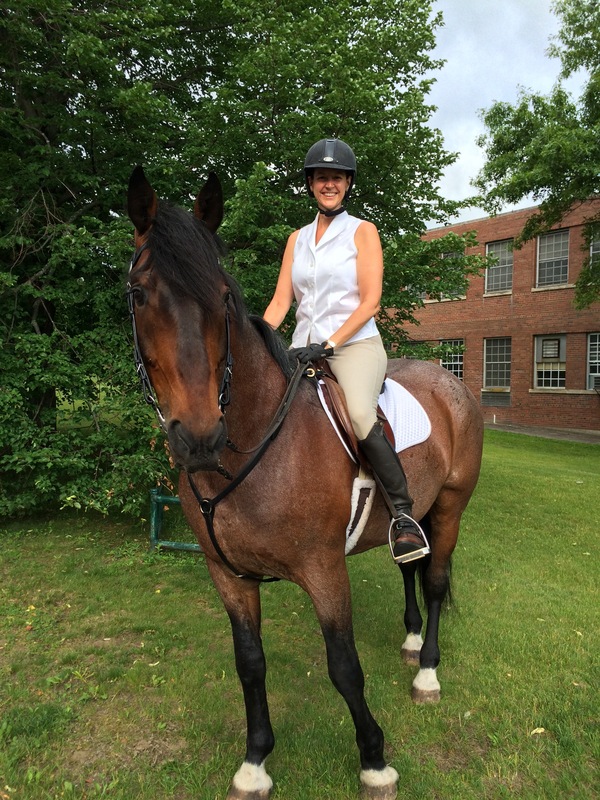 We should get extra credit on our next judged pleasure ride for this performance.” The horses were great! And so was our ride!